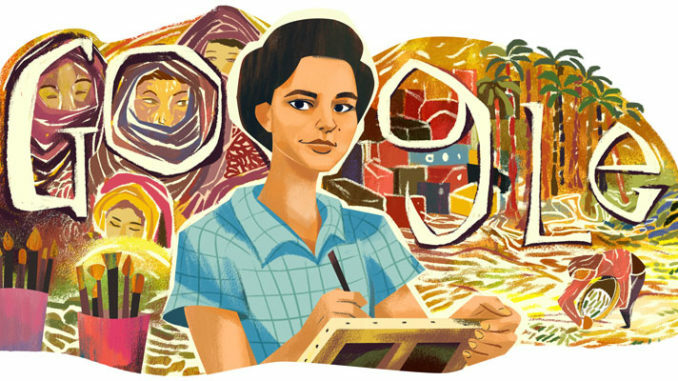 Inji Aflatoun’s 95th Birthday – Today’s Doodle celebrates Inji Aflatoun, the Egyptian painter and author remembered as a trailblazing modern artist and pioneering feminist. Born in Cairo on this day in 1924, Aflatoun was mentored by the Egyptian artist Kamel El-Telmissany, soaking up his introduction to modern art as well as his interest in social issues. In 1942 Aflatoun exhibited with the avant-garde Art and Freedom Group. She then went on to co-found the League of Young Women in University and Institutes and wrote influential pamphlets like We Egyptian Women. Aflatoun exhibitied her work around the world. In 1975, she helped organize the exhibition “Ten Egyptian Women Artists in Half a Century” in honor of the International Women’s Year. In 1986, she was awarded the medal ”Cavalier of the Arts and Literature” by the French Ministry of Culture. Today, her work hangs in major collections and museums around the world. Happy 95th Birthday, Inji Aflatoun!